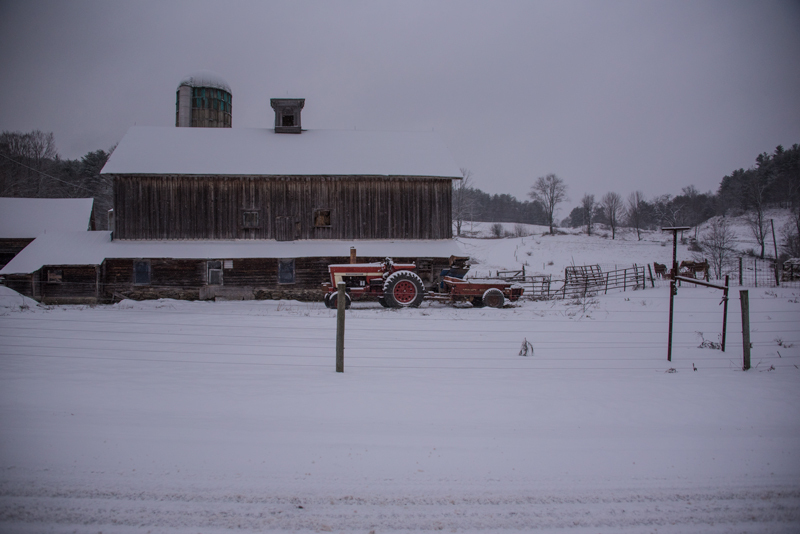 The old red tractor rests peacefully alongside the barn at Misty Meadow Farm in Pawlet. We all deserve a little break now and then, a time to reflect and give thanks for our blessings. While we thoughtfully plan our next move. Thank you for joining me on this amazing adventure. I can’t wait to see where we go from here. I love to see your work. I miss VT terribly, but could not retire there sadly. Thanks Dhyan, I’ll keep em coming for you! Whenever I see your name in my inbox, I can’t wait to see what you’ve painted. Thanks for the monthly bit of joy! Another great painting! Happy New Year! Thanks Cynthia, and discovery is exactly what I’m after. Chances are we’ll both be surprised with what I come up with in 2017… hopefully pleasantly! Love this painting !! Happy New Year Peter !! Another true beautiful picture of Vermont. Just love all of your paintings around Vermont. Vermont Life at its best all year long. Thanks for all your support Kathy! I love to compare photos to artistic renditions. While the photo captures a moment in time, this painting goes beyond the moment and captures the slow sweep of passing days and months and years. Fences and grass lines sag and flow in gentle arcs, like celestial planets in perpetual orbit. 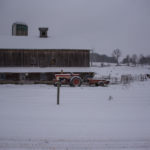 The slight and poetic slant to the vertical lines of the barn and tractor seem to anticipate, almost prophesy, a future time when this quiet moment of rest and reflection will be complete, and only memories of what was here will remain amongst the rocks and fields. You are a poet Brian, thank you for your kind words. Yes, this piece has a more lyrical, curvilinear design that some of my work. Look forward each week to your painting. 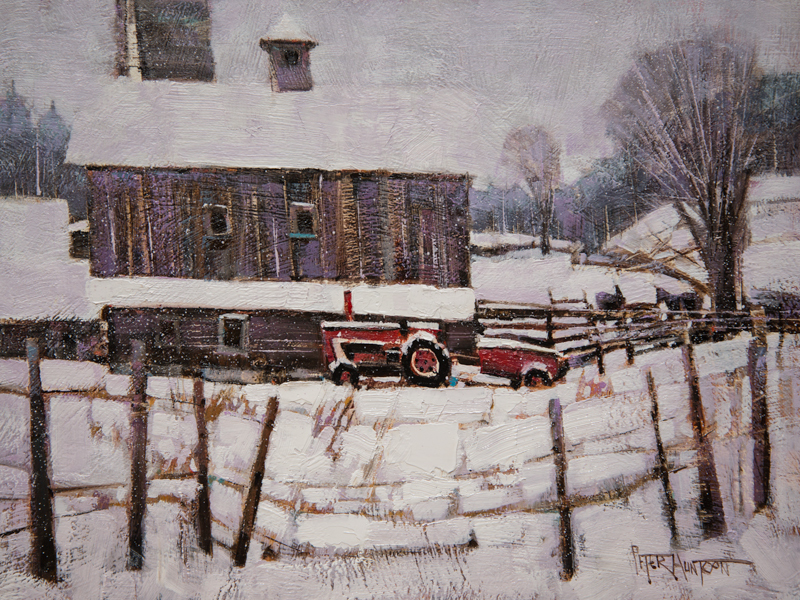 I grew up in the northeast kingdom on a farm so the country scenes evoke some dear memories for me. Love your artistic style. I keep saying I have to get up to the NEK. I’ll make it a goal in 2017 for sure. Thanks Marcia! Love seeing my dads farm in print. The horses are Sundae and Bubba!! I love painting this farm Winona. The real deal. Thank you, and your dad! Thanks again for my dose of Vermont. Just returned from a visit in southern New England and this week’s painting completes my journey. Happy New Year Peter! Glad you had a good holiday and made it home safe Brian, happy new year!